Pennsylvania State Police cadets learn how to apply a tourniquet during Stop the Bleed training. 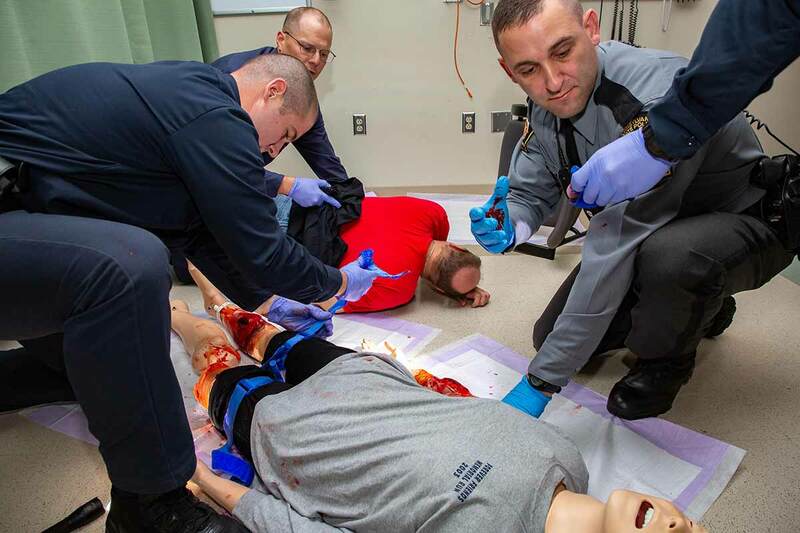 Penn State Health Milton S. Hershey Medical Center trauma prevention staff led about 100 Pennsylvania State Police cadets in Stop the Bleed training on Nov. 3. Cadets listened to a lecture about Stop the Bleed and participated in training sessions with live actors in the simulation labs. Penn State Health is part of a national Stop the Bleed awareness campaign that encourages bystanders to become trained on first aid techniques and equipped to help in a bleeding emergency before professional help arrives.